I've recently encountered lots of annoying Ads in my iPhone and iPad. Can I stop ads from showing while I play games on my iPhone and iPad? The ads on your iOS games are well aimed especially after Apple introduced a new way of tracking system in iOS 7 and iOS 7.1. For your privacy, you can turn off the iPhone tracking system in iOS 7/7.1. However, this doesn't mean that the ads on your game apps are totally removed. Download and install the freeware to your computer and follow the guide to see how to block ads on iPhone games (steps for iPad and iPod touch are the same) without even jailbreak. Note: The software has 2 versions, one for Windows users and the other for Mac users. Make sure you download the right one. 1. 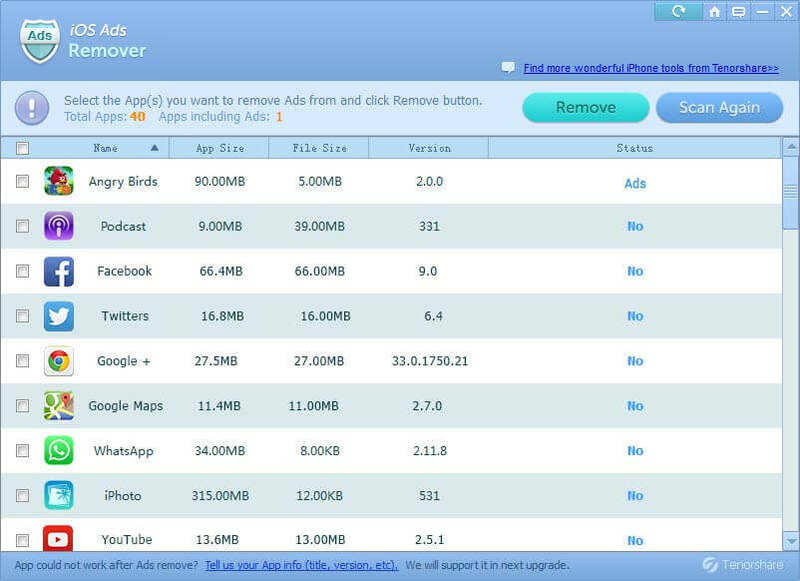 Connect your iPhone to computer and run iOS Ads Remover on your computer. This software will automatically detect your device and show you the "Start Scan" button. Click this button to scan all the apps on your device. 2. After scanning, all your apps and games will be display. Select the games of which you want to remover ads and click on the button "Remove" to block ads for free. After the ads are removed, you can play ads-free iOS games now. For your information, we've also picked up the top 10 free iPhone games. Check for details if you in the mood for more interesting games!